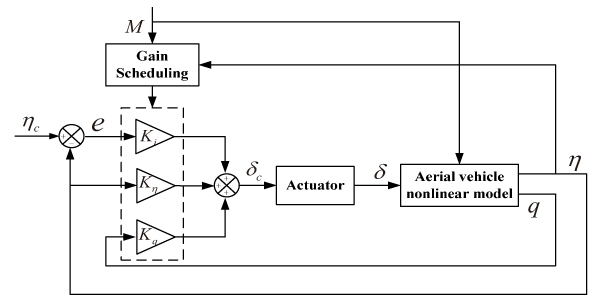 A novel systematic technique for gain-scheduled control based on fixed-structure synthesis is adopted to design the aerial vehicle autopilot. The gain-scheduled design can be transformed into the multi-model control problem with both controller architecture and gain-scheduled architecture defined a priori. Hidden coupling terms naturally arise in the linearized dynamics of the gain-scheduled controller when some of the state variables are also used as scheduling variables. Unlike traditional approaches that do not consider these terms, the proposed method takes the hidden coupling terms directly into account in the synthesis phase. Finally, numerical simulations are carried out to evaluate the effectiveness of the proposed methods. B. Li, D. Lin, S. Tian, and Z. Yang, “Gain-Scheduled for Aerial Vehicle Autopilot Design Using Fixed-Structure Synthesis,” J. Adv. Comput. Intell. Intell. Inform., Vol.22, No.3, pp. 316-322, 2018. R. T. Reichert, “Dynamic Scheduling of Modern-Robust-Control. Autopilot Designs for Missiles,” IEEE Control Systems, Vol.12, Issue 5, pp. 35-42, 1992. R. A. Nichols, R. T. Reichert, and W. J. Rugh, “Gain Scheduling for H-Infinity. Controllers: A Flight Control Example,” IEEE Trans. on Control Systems Technology, Vol.1, Issue 2, pp. 69-79, 1993. J. S. Shamma and J. R. Cloutier, “Gain-Scheduled Missile Autopilot Design Using Linear Parameter Varying Transformations,” J. of Guidance, Control, and Dynamics, Vol.16, No.2, pp. 256-263, 1993. D. Lawrence, J. Kelly, and J. Evers, “Gain Scheduled Missile Autopilot Design Using a Control Signal Interpolation Technique,” Int. Conf. on AIAA Guidance, Navigation, and Control, pp. 1394-1402, 2006. S. Theodoulis and G. Duc, “Missile Autopilot Design: Gain-Scheduled and the Gap Metric,” J. of Guidance, Control, and Dynamics, Vol.32, No.3, pp. 986-996, 2009. D. Saussié, L. Saydy, and O. Akhrif, “Gain Scheduling Control Design for a Pitch-Axis Missile Autopilot,” 2013 Int. Conf. on AIAA Guidance, Navigation, and Control, pp. 1-18, 2013. J. S. Shamma and M. Athans, “Analysis of Gain-Scheduled Control of Nonlinear Plants,” IEEE Trans. on Automatic Control, Vol.35, Issue 8, pp. 898-907, 2002. W. J. Rugh, “Analytical Framework for Gain Scheduling,” IEEE Control Systems, Vol.11, Issue 1, pp. 79-84, 1991. D. A. Lawrence and W. J. Rugh, “Gain-Scheduled Dynamic Linear Controllers for a Nonlinear Plant,” Automatica, Vol.31, Issue 3, pp. 381-390, 1995. W. J. Rugh and J. S. Shamma, “Research on Gain Scheduling,” Automatica, Vol.36, Issue 10, pp. 1401-1425, 2000. D. J. Leith and W. E. Leithead, “Survey of gain-scheduling analysis and design,” Int. J. of Control, Vol.73, Issue 11, pp. 1001-1025, 2000. H. Lhachemi, D. Saussié, and G. Zhu, “Gain-Scheduling Control Design in the Presence of Hidden Coupling Terms via Eigenstructure Assignment: Application to a Pitch-Axis Missile Autopilot,” American Control Conf. (ACC), pp. 4041-4046, 2016. P. Gahinet and P. Apkarian, “Automated Tuning of Gain-Scheduled Control Systems,” IEEE 52nd Annual Conf. on Decision and Control, pp. 2740-2745, 2013. P. Gahinet and P. Apkarian, “Structured H∞ Synthesis in MATLAB,” 18th Proc. of IFAC, pp. 1435-1440, 2011. D. Saussié, Q. Barbes, and C. Berard, “Self-Scheduled and Structured H∞ Synthesis: A Launch Vehicle Application,” American Control Conf., pp. 1590-1595, 2013. H. Lhachemi, D. Saussié, and G. Zhu, “A Structured H∞-Based Optimization Approach for Integrated Plant and Self-Scheduled Flight Control System Design,” Aerospace Science and Technology, Vol.45, pp. 30-38, 2015. R. C. D. Valle, L. L. Menegaldo, and A. M. Simões, “Smoothly Gain-Scheduled Control of a Tri-Turbofan Airship,” J. of Guidance, Control, and Dynamics, Vol.38, No.1, pp. 53-61, 2015. P. Apkarian and D. Noll, “Nonsmooth H∞ Synthesis,” IEEE Trans. on Automatic Control, Vol.51, No.1, pp. 71-86, 2009. Z. D. Tian, S. Li, and Y. Wang, “Generalized Predictive PID Control for Main Steam Temperature Based on Improved PSO Algorithm,” J. Adv. Comput. Intell. Intell. Inform., Vol.21, No.3, pp. 507-517, 2017. P. Apkarian and D. Noll, “Nonsmooth Optimization for Multiband Frequency Domain Control Design,” Automatica, Vol.43, Issue 4, pp. 724-731, 2007. A. M. Simões, P. Apkarian, and D. Noll, “Nonsmooth Multi-Objective Synthesis with Applications,” Control Engineering Practice, Vol.17, Issue 11, pp. 1338-1348, 2009.